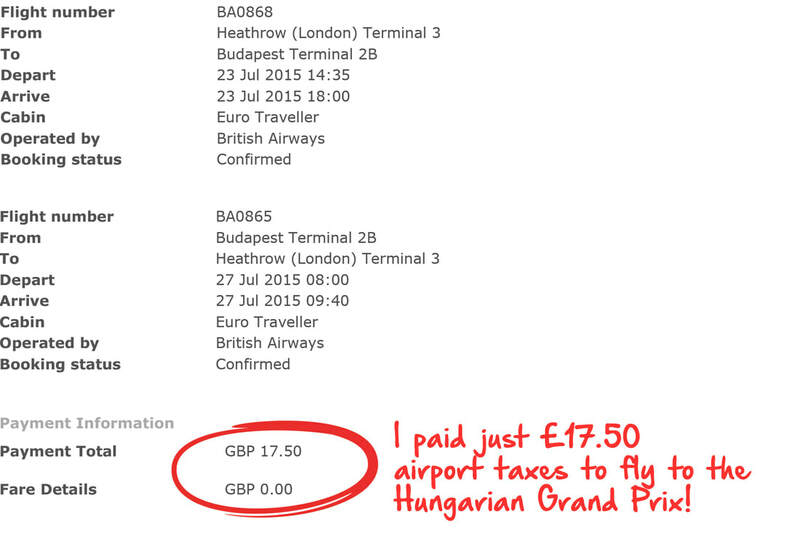 Here’s how I’ve got free flights (including free Business Class flights) to see Formula One races across the globe. And sometimes I can even take a friend too! Well, it does take some forward planning but you don’t have to be a millionaire to get a taste of the F1 lifestyle. Did you know there are credit cards out there that will give you free flights just for using their card? I’m a member of the British Airways Executive Club (this is their frequent flyer programme) and I also have an Executive Club American Express credit card. So, how does this get me free flights to see Formula One Grand Prix? Every time I fly on British Airways or one of their partner airlines I get frequent flyer points credited to my Executive Club account which I can use to redeem free flights to anywhere on the British Airways network. All I have to pay is the airport taxes. Now, if you’re thinking “That’s great Rob but I’m not a frequent flyer”, keep reading because I’m not actually a frequent flyer either (at least not with one airline). For me, the key to getting free flights is the Executive Club American Express credit card. Every £1 I spend on my Executive Club American Express credit card gives me an extra point towards a free flight. Over the years I’ve collected enough point to get me to the Hungarian Grand Prix in Budapest and the United States Grand Prix in Austin just by using my Executive Club American Express credit card for day to day purchases like shopping and fuel. I pay of the card balance every month so I never get charged any interest. It may take you a few months or a few years to collect enough points for a free flight. A free flight to Europe requires fewer points than a flight to the USA (if you live in Europe) and how much you spend on your card each month will determine how quickly your points mount up. My advice is simple. The sooner you get started, the sooner you’ll have enough points for a free flight. When you’ve collected enough points for your free flight you’ll need to book in advance to get the flights you want. I’ve bagged myself free travel on prime time flights over a Grand Prix weekend. When I few to Budapest for the Hungarian Grand Prix I was on the same flight as Damon Hill and some of the McLaren team. When I flew to Austin for the US Grand Prix I’d collected enough points for a seat in Business Class and sat in the same cabin as David Coulthard, Christian Horner and Paddy Lowe. If free flights for yourself wasn’t good enough, there’s an extra benefit with some credit cards as well. If I spend a minimum amount on my Executive Club American Express credit card in a twelve month period I get a free companion voucher so I can take a friend with me too. It’s just like a “buy one get one free’ deal and all you have to pay is the airport taxes. If you use this voucher for Business Class flights you’ll be saving thousands of £££s. Apply by clicking the button below and you could earn a welcome bonus if you application is approved and you meet any minimum spend requirements. You can do this with other airlines as well but you'll have more choice with British Airways as they fly to most Grand Prix cities. Most airline frequent flyer programmes have a similar set-up with various credit card providers.